Hello and TGIF! I still cannot believe we are in the first week of summer, a little scary! Hope all is well on your end. 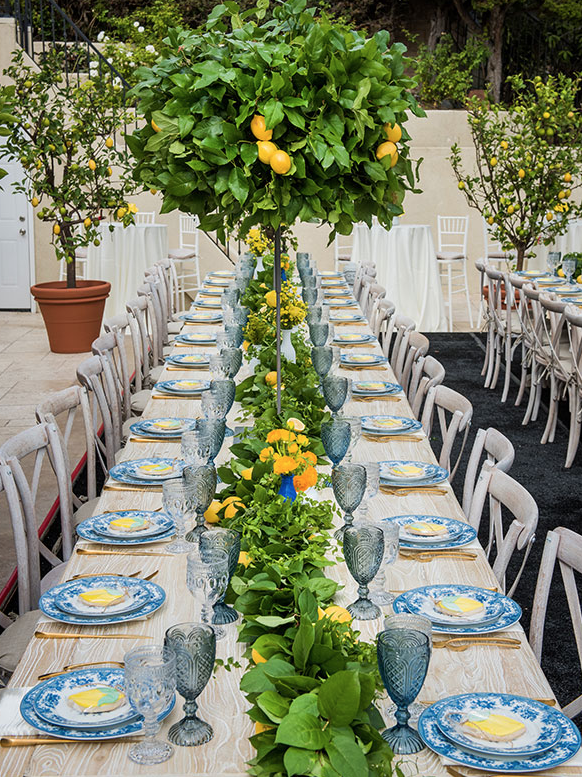 So, for a long time I have always admired tables and parties that center around lemons. Such an easy thing to do, you would think. 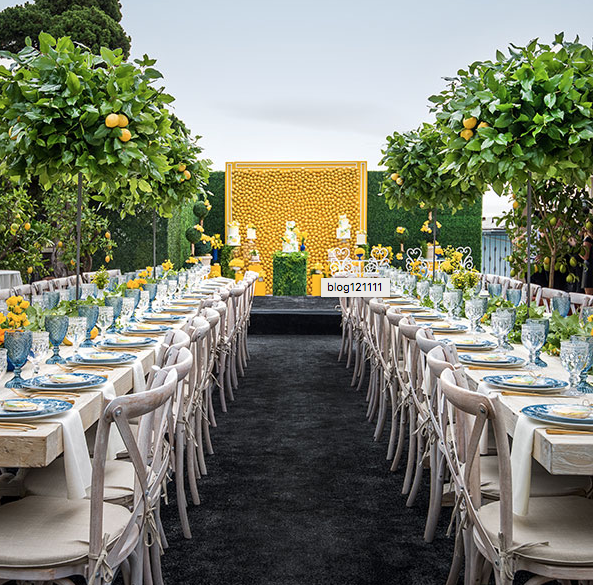 And really it is, but these tables and parties show using lemons when taken to the next level. 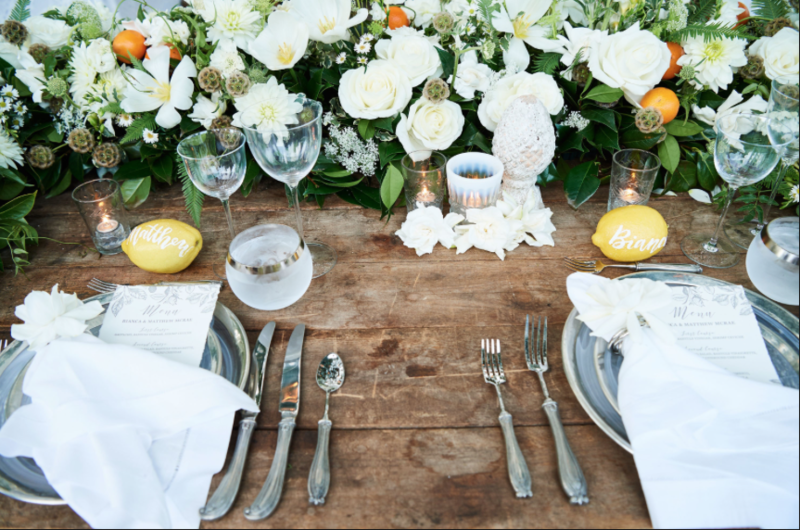 Each one of these is so inspiring, just doing this post makes me want to throw a table or at the very least, set a table with lemons front and center. 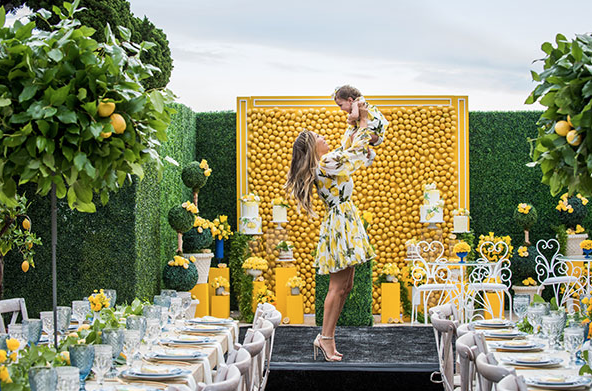 Found this incredible lemon themed first birthday party over at Diana Madison (my first birthday most certainly did not look like this)! More from the amazing fete at Diana Madison! 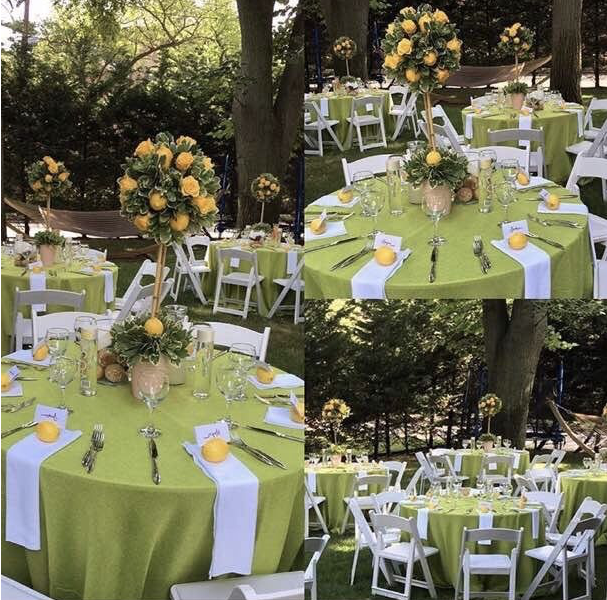 A few more from the party at Diana Madison….so amazing and don’t you love her lemon themed dress! 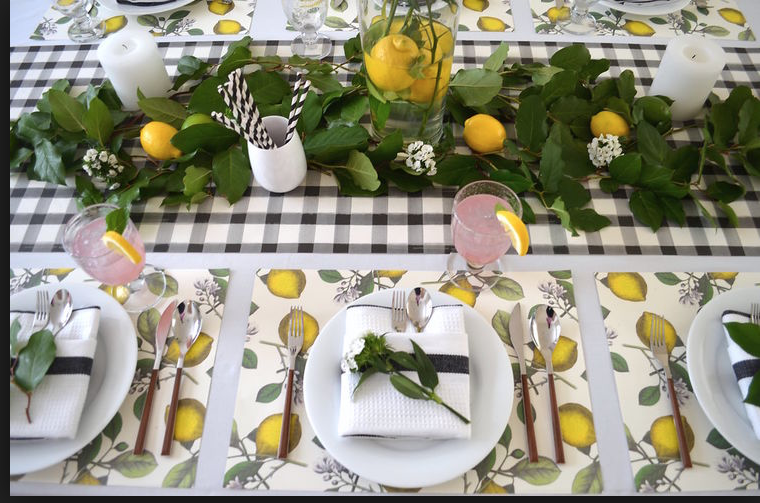 So…… now do you see why I am having a bit of an obsession with a lemon themed party/dinner party? I need to figure something out, even if its a small something. Just makes such a great theme, though I think it has to be something in the summer. Maybe a farewell to summer luncheon or dinner, need to think about this one. And you…..what do you think? Haven’t yet…thinking when I have book club! Must be the most elaborate first Birthday party ever! 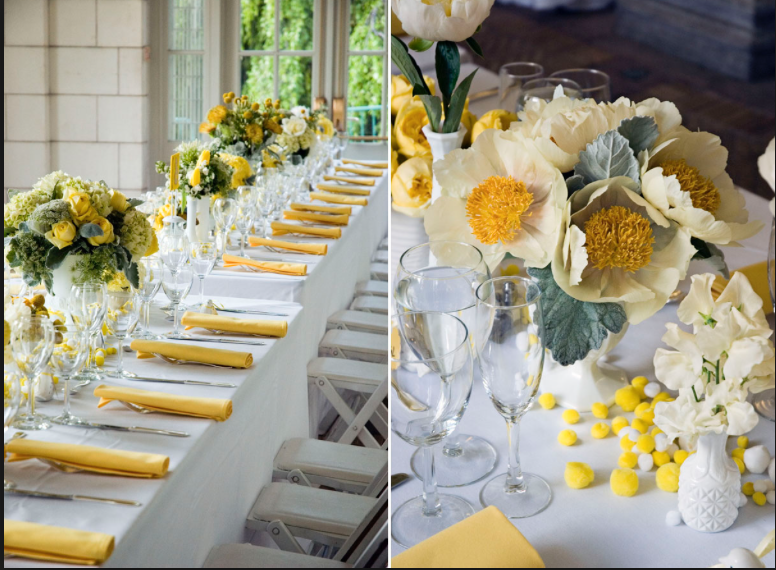 Just love all the yellow! 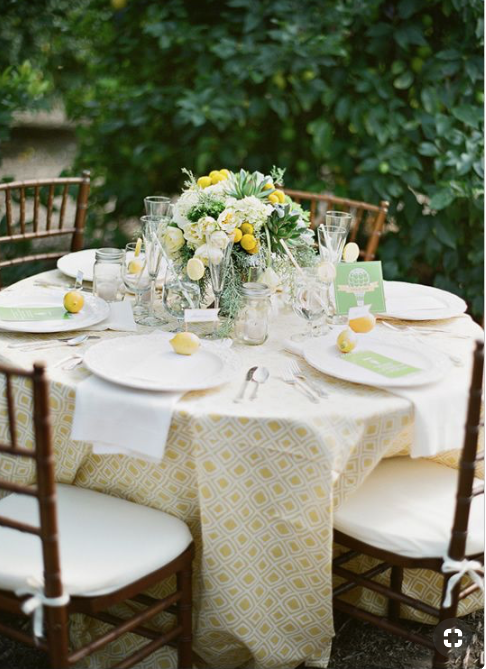 I think the yellow napkins add a beautiful touch! What a beautiful post. 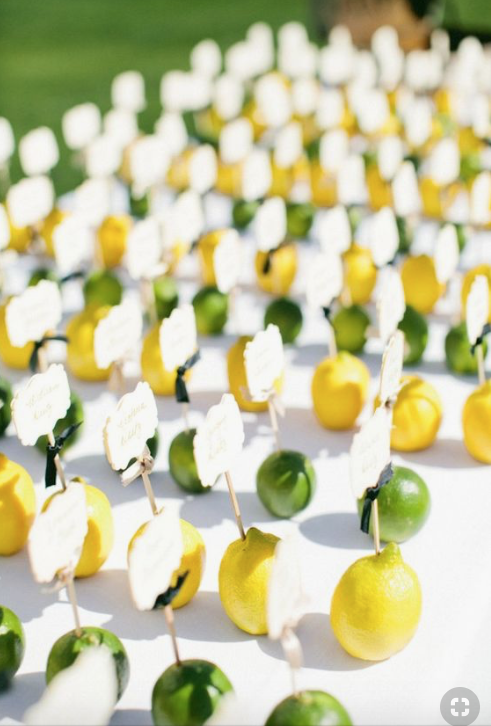 This makes me want to plan a lemon themed party too! The addition of greenery is just beautiful. 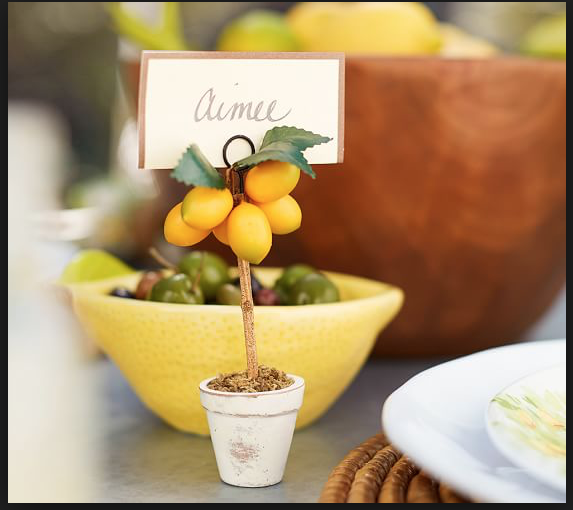 What a fun idea to use lemons as place cards, something so easy for anyone to do. Wasn’t finding lemons in my market for two weeks. Help! Was just thinking how much I use lemons when they weren’t available. Was told it was due to the fires in Ca. 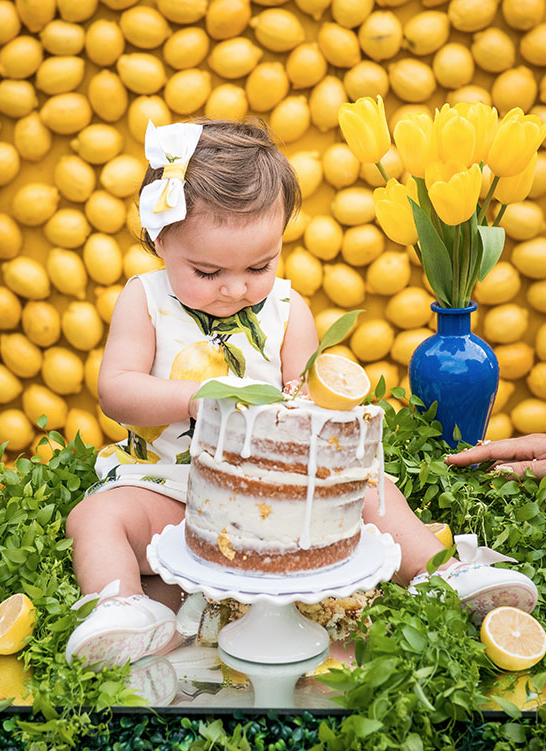 Then I saw all of the lemons used in the baby’s birthday and thought what a waste. Hope they were faux. This so reminds me of Scottsdale. Tons of lemon trees that produce large and juicy lemons. One year I had a dinner party the firrrst week of January. I was so tired of the Christmas decorations, but didn’t have time to take everything down. What to do .. what to do. I tuned and looked out to the backyard and WAHLA! I cleaned off my mantel and took the ornaments off the small trees. I left some of the round ornaments. 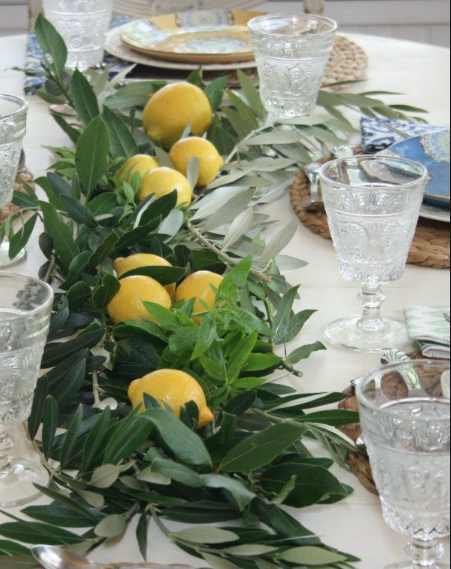 Then, like a mad woman, I grabbed my cutting sheers and wnttt straight for the lemon trees. 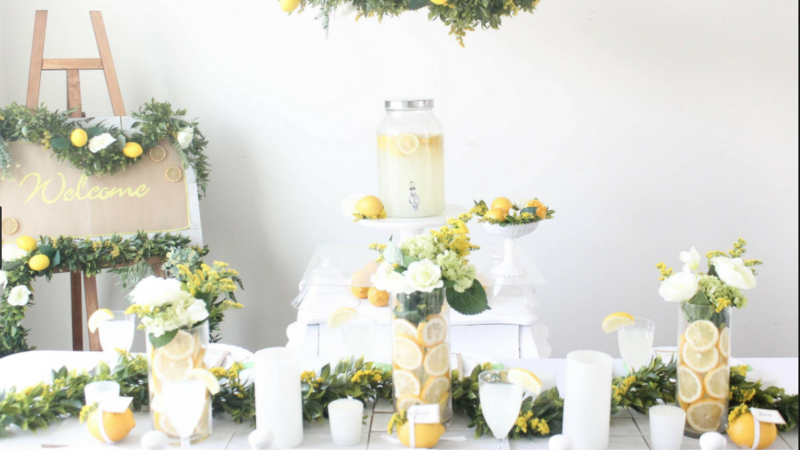 Cutting medium and small branches with both lemons and foliage, I layered the pieces like a garland along the top of the mantle and down the center of ttthe table. I stuck small branches in the smaller Xmas trees. 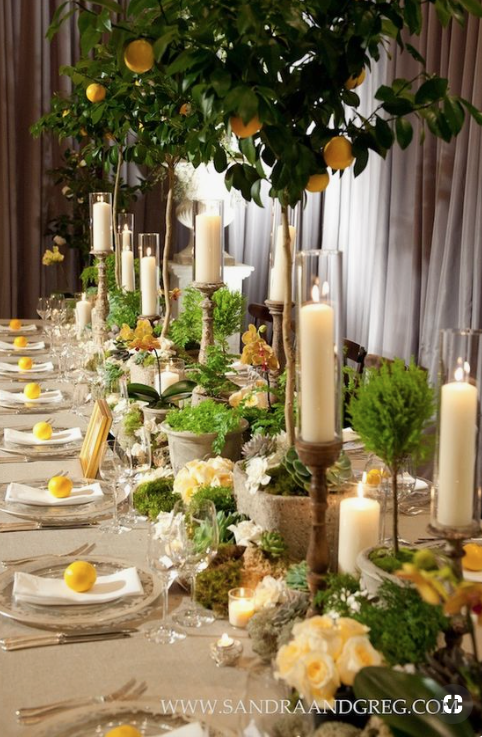 I interspersed the round Xmas balls and ivory candles amongst the lemon branches. And the whole atmosphere was breathtaking alive, and the smell … DEVINE!!!!! Love lemons, particularly their scent. Now, don’t rush summer! I know we are already being inundated with fall ideas everywhere but life moves too fast. Breath, just breath! These are beautiful photos. 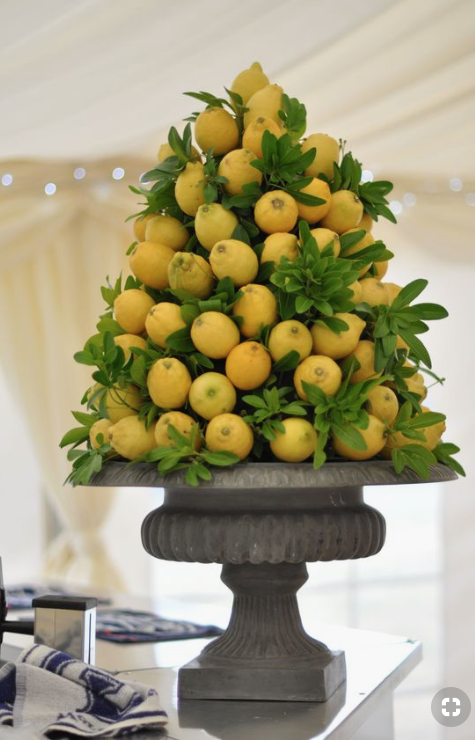 Please bring back the porcelain lemon topiaries from Italy. Have been looking and looking for a nice one! Just can’t find one. Help!!!! So refreshing; makes me think of Italy and sunflowers for some reason. Gorgeous post! So inspiring! 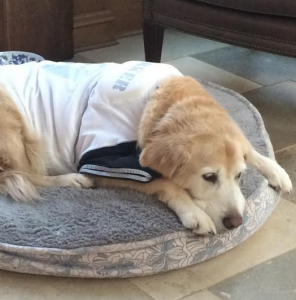 Where did you purchase that very pretty doggie bed please? Tina, My silver table top lamps arrived are they are stunning! As usual, with everything that I have ordered form your shop, the quality is amazing. Thank you for providing so many excellent products at reasonable prices. 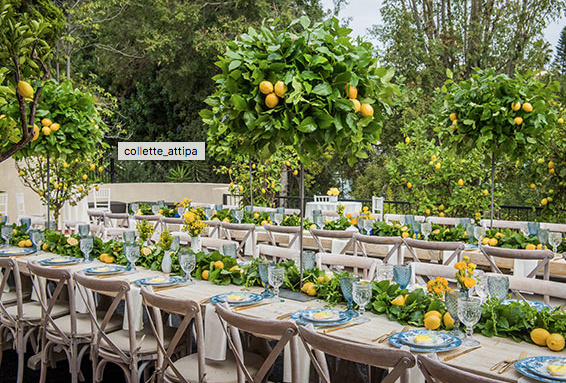 Tina, these lemon photos are beautiful! But whatever you do, “don’t throw a table.” I am sure that you meant party, but found the mistake funny.